Some of the biggest news on the women's side at the French Open has been talk of the potential quarterfinal between Serena Williams and Maria Sharapova. That's it: Enjoy the tennis! And if you want to get some doubles picks, check The Doubles Alley within the next couple of days for predictions there. Rafael Nadal's going to win. The women's prediction post is coming soon! 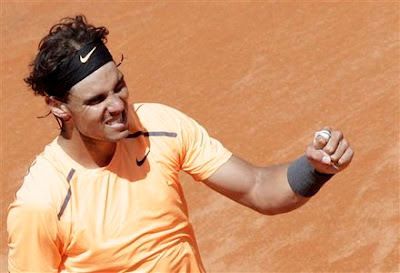 What have we learned during the clay-court season so far? • Maria Sharapova is as legit as they come when it's time to get down and dirty on the dirt. I remember saying a few times over the past couple of years that she shouldn't play on clay to save her shoulder. So much for that notion! • Rafael Nadal looks pretty good on the stuff. So does Novak Djokovic. • The red stuff, that is. We all know how they felt about the blue stuff in Madrid. 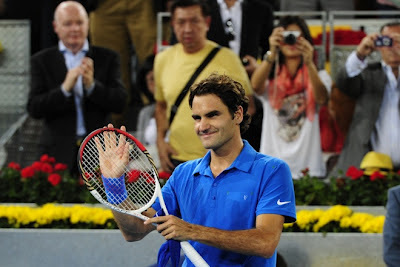 • Roger Federer and Serena Williams didn't seem to mind it as much, and are playing super-solid as well. • Defending French Open women's champ Li Na is rounding into form. Last year's finalist and '10 champ Francesca Schiavone is rounding out of form. • Sara Errani, she of the three tournament wins on the dirt so far this year, could be a darkhorse—or she could get pummeled against elite, hard-hitting players which seems to be the case the past few weeks. • Andy Murray is going to be hard-pressed to defend his Roland Garros semifinal points. • Maybe Tomas Berdych will be the one to grab them up? Or David Ferrer? Or Juan Martin del Potro? 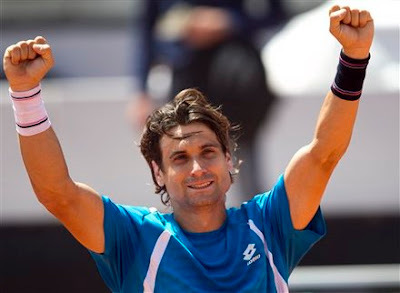 David Ferrer and the 'Big 3': How will that work out? It all almost went to plan with the top four men all making the semifinals of this week's tournament in Rome. That is, until Richard Gasquet threw a wrench in the plans by knocking off Andy Murray in the round of 16. Gasquet, in turn, had a wrench thrown in his plans by the indefatigable (come on, how many times do you see that word in a blog post?) David Ferrer. Now Ferrer has to take on Rafael Nadal, while Novak Djokovic and Roger Federer square off. It's a great effort by Ferrer, but you have to feel his run is going to come to an end against Nadal. Provided he does knock off Rafa, would he have enough game in him to win the finals? And there you would have it: Another major tournament won by a member of the "Big 4." It's tough out there for the guys. I'd been thinking over the past couple of days that there are only two solid chances for guys such as Ferrer, Jo-Wilfried Tsonga or Tomas Berdych to get far in a big tournament: If they're in Murray's part of the draw on clay or Nadal's on a hard court. Of course, there's been some exceptions—even this year with John Isner at Indian Wells and Berdych breaking out in Madrid. But I also feel those are fluke events. I guess the point I'm trying to make is that guys outside the Big 4 are vying for semifinal spots and seeing what happens from there. Ferrer's the latest and he's indefatigable (I just wrote that to write it) enough where you hope he gets an even bigger breakthrough. It seems like the odds will be tough, though. The draw at the Italian Open has some pretty great round of 16 matches on the men's side: I feel this round is one of the strongest at a Masters 1000 event all year. And call me crazy, but for some reason, I think these head-to-heads will reveal a lot about some players and where they're at and going in the months ahead. Case in point: I see a lot of ramifications in that Novak Djokovic and Juan Monaco matchup. Djokovic's year so far hasn't exactly matched up to the incredible 2011 at this point. Monaco's playing some of the best tennis of his career so far in '12. This is a great test for both of them: For Novak, it could only boost his confidence heading into the French and for Monaco, a win could prove that he's on the right track to the top 10. And how about Andy Murray vs. Richard Gasquet? Murray's coming off an injury and Gasquet is looking solid so far on the dirt. Tomas Berdych, runner-up last week in Madrid and a former French Open semifinalist, goes up against Nicolas Almagro for what seems like the 12th time this year. A win for either one of them solidifies their chances as French Open darkhorses. You even have an unseeded match that really bears watching with implications going into the weeks ahead: Andreas Seppi vs. Stanislas Wawrinka. Neither one of them are players a big guy wants to see early on at the French. Having a quarterfinal appearance at the Italian Open would only enhance their drive to take out a big scalp at Roland Garros. It's a big day ahead, with victories that could leave a big impact. 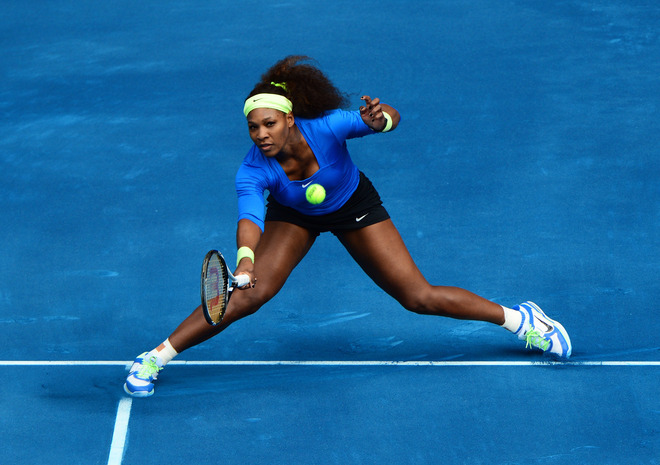 It's semifinal time now at the much-maligned Madrid event. On the men's side, Roger Federer will go up against Janko Tipsarevic, while Juan Martin del Potro faces Tomas Berdych. For the women, Serena Williams is slated to play qualifier Lucie Hradecka and for the cajillionth time--this year--Victoria Azarenka and Agnieszka Radwanska will do battle. Where's Rafael Nadal? Novak Djokovic? Maria Sharapova? Well, Fernando Verdasco (who got beat by Berdych today), Tipsarevic and Williams, respectively, got them. Nadal and Djokovic had a lot--I mean, a LOT--to say about the event's use of the now-infamous blue clay. Federer voiced his complaints and Serena seemed to blow off any thoughts about it. But of all four of those great/legendary players, only Federer and Serena are still around this weekend, when that shouldn't be the case--unless it just really comes down to what types of playing styles are more conducive to success on the surface. Still, though, I would think Nadal and Djokovic would've been able to tag their respective countrymen on any surface. Maybe it's just all a matter of the approach: Federer and Serena go on to fight another day after making their thoughts none and moving on. Nadal and Djokovic made their thoughts known, and then some, and now they're left to regroup for Rome. An interesting contrast between the two pairs, and I wouldn't be surprised at all to see the two that are still in Madrid hold up the big trophies at the end. What say you about the Madrid blue? I guess I've been reading too much Dr. Seuss to my daughter! Anyway, the Madrid Masters/Premier event is well under way at this point and players are getting their feet dirty on the famed/controversial/nontraditional/what-have-you blue clay. I have an adjective to throw in about it: weird. It just seems so odd and out of place to me, personally. And I also feel that it kind of takes away some of the status of what's supposed to be an elite event. It looks like something that should've been rolled out for an exhibition--or at least a smaller-scale tournament. Of course, how it plays is a big factor for the folks who have to compete on it and there have been mixed reports from both the ATP and WTA stars. It's way too late to do anything about it: Post-tournament will be the determining fate of its future. Or maybe it'll be hear to stay. Either way, it doesn't seem to bother Serena Williams too much, who tweeted the other day that it's OK: She'll play on ice if she has to. How will Sara Errani stack up against the elite? This has been a dream season so far for Italian Sara Errani: She made the quarterfinals at the Australian Open early in the season and has just reached her third final of the year on clay, this time in Budapest. She's actually on a 14-match winning streak in '12 on the dirt and doesn't seemed to be having too many problems against the opponents she's come across. She blitzed through the field at her last event in Barcelona. If she wins this title, you'd have to consider her among the favorites at the French Open in a few weeks. She's knocking off top-25 talent at these tournaments, but what happens when she faces Agnieszka Radwanska or Samantha Stosur? Or even Maria Sharapova, who has already won one of the biggest clay-court events so far this season in Stuttgart? I actually think Errani will do OK. Granted, she's not beating current members of the top 10 right now, but winning usually begets winning. If she heads into the later rounds in Madrid or Rome on that huge streak, it'll take a big effort to beat her. Errani's ranking isn't likely to make it to the top 15 come French time, but she'd definitely be a dangerous matchup for someone like Caroline Wozniacki early on if they were to play. And I'd take Errani in a match against a good number of the top 32. She may not have the elite status yet, but it looks like it's coming for Errani--perhaps even post-French Open. FLYING HIGH ON CENTRE COURT: RUFUS VS. KYRGIOS?